Brussels: The U.S. commitment to NATO – an Alliance forged from the ashes of World War II that has remained a necessary defense measure against common threats for more than half a century – is strong and this Alliance remains the bedrock for transatlantic security. At the top of this list, when it comes to facing national and international security challenges, is defeating ISIS, which is a threat to all member countries and partners. This was emphasised by Rex W. Tillerson, the US Secretary of State at the Meetings of NATO Ministers of Foreign Affairs in Brussels, Belgium this past weekend. Tillerson also categorically stated that the NATO alliance is also fundamental to countering both non-violent, but at times violent, Russian agitation and Russian aggression. The United States, he further said, is committed to ensuring NATO has the capabilities to support our collective defense. We understand that a threat against one of us is a threat against all of us, and we will respond accordingly. We will uphold the agreements we have made to defend our allies. Quoting the US President, the Secretary of State said that he Trump has made it clear that it is no longer sustainable for the U.S. to maintain a disproportionate share of NATO’s defense expenditures. He urged the Allies to increase defense spending to meet their commitments in accordance with the Wales Pledge on Defense Investment. The President supports NATO. The U.S. Congress supports NATO. The U.S. Senate has just overwhelmingly approved Montenegro’s NATO accession protocol. We are now one step closer to welcoming Montenegro as a full member of the Alliance, Tillerson went on to observe. Tillerson went on to echo what US Defense Secretary James Mattis said at the Defense Ministerial in February: Allies that do not have a concrete plan to spend 2 percent of GDP on defense by 2024 need to establish one now. Allies that have a plan to reach the 2 percent guideline need to accelerate efforts and show results. And for those Allies already spending 2 percent of their GDP on defense, we applaud your efforts and hope you’ll work with us to encourage others to do more. Our goal should be to agree at the May Leaders meeting that by the end of the year all Allies will have either met the Pledge guidelines or will have developed plans that clearly articulate how, with annual milestone progress commitments, the Pledge will be fulfilled, said Tillerson. 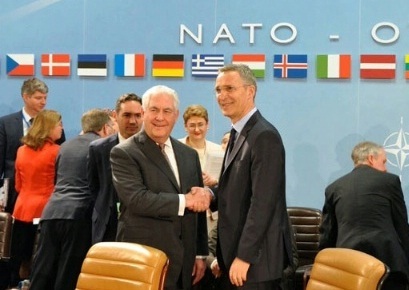 On fighting terrorism, the US Secretary of State said that NATO can and should do more. Fighting terrorism is the top national security priority for the United States, as it should be for all of us. “After last week’s tragic events in London, the importance of that fight has been made clear yet again. NATO has a number of unique capabilities it can bring to this fight. At the Warsaw Summit last year, NATO members recognized cyberspace as an operational domain, alongside land, air, and sea. While meeting the challenge of the fight against terrorism, we must remain vigilant in strengthening NATO’s eastern defenses. Allied commitments to Operation Atlantic Resolve and Enhanced Forward Presence have sent a clear message. But long term stability, from Baltic to the Black Sea, depends upon all allies, not just those who are the most exposed, paying their full share for defending the Alliance.